"Through the integration of technology into classroom and lab activities, Alaina's students gained invaluable skills that they’ll carry with them well beyond high school. More than simply gaining competence in science and technology, students also developed a deeper understanding of how they can bring public awareness to local concerns by utilizing technology in a polished, professional manner." Congratulations to Alaina Weinsztok, our January 2018 Featured Teacher. 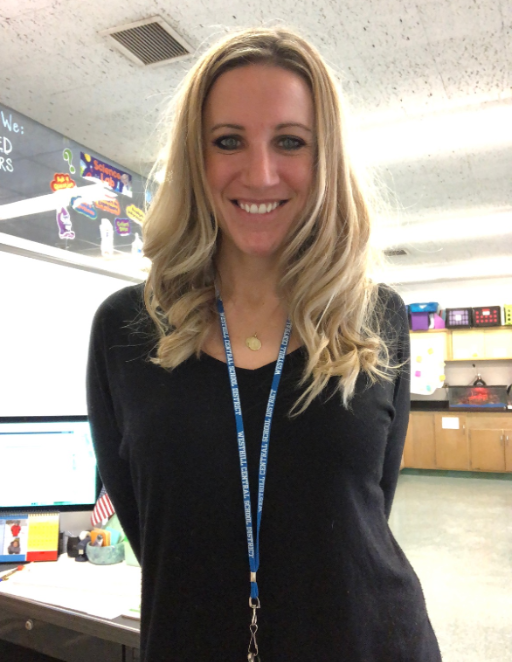 Alaina has 13 years’ experience as an educator, and has spent the past four years teaching Living Environment to freshmen and sophomores in the Westhill Central School District. How has this teacher brought innovation to his or her classroom? Alaina has incorporated technology into both her classroom and lab activities through a recent study of Onondaga Lake. Via her project-based learning (PBL) activities and a grant through Syracuse University, Alaina’s Honors Biology class created a Google Site to share information about reciprocity and Onondaga Lake. The students visited the Skä noñh Great Law of Peace Center, and learned how traditional oral forms of ecological knowledge can be combined with scientific experimentation and data to form a more complete understanding of what’s being studied. Students also stopped by the Onondaga Lake Visitors Center, and spoke with representatives from Honeywell to learn more about the company’s lake restoration efforts. Alaina’s students then explored Harbor Brook (the stream behind the high school) to increase their knowledge of freshwater systems, and tested the water quality while there. Using a map, the students charted the path of the stream to Onondaga Lake, and realized that it did not pass through a wastewater treatment plant before reaching the lake. How have students and staff benefitted from Beth's technology integration initiatives? Through the integration of technology into classroom and lab activities, Alaina's students gained invaluable skills that they’ll carry with them well beyond high school. More than simply gaining competence in science and technology, students also developed a deeper understanding of how they can bring public awareness to local concerns by utilizing technology in a polished, professional manner. The project encouraged student “voice and choice,” which in turn created an authentic, memorable learning experience. Alicia plans to have this year’s Biology students create a similar website, which will focus on informing the Westhill Community about the dangers of ticks. Are you the type of teacher who thinks about technology integration and new ways to enhance instruction, engage students, and make learning fun? Know someone who fits the profile? Recommend a "Featured Teacher" so we can recognize and celebrate great work in the area of instructional technology!